Why Did I Listen To The Oversight by Charlie Fletcher? The Oversight by Charlie Fletcher appealed to me because the description made me think of Jonathan Strange And Mr. Norrell which I read such a long time ago and absolutely loved. I decided to download it via Netgalley and then let it sit on my queue and on my Kindle for a very long time. Finally, I gave this book a shot over Summer of Netgalley which is essentially what I am dubbing this summer. I saw it was available on Hoopla like all of the other great things in my life and decided that now was indeed the time to listen to it. 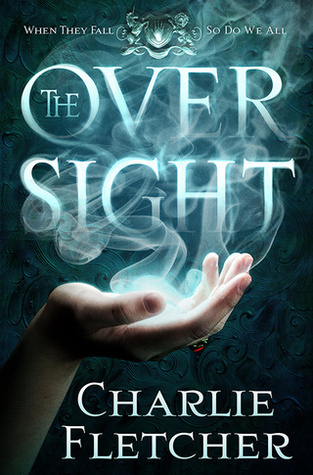 Charle Fletcher’s The Oversight is about these people who oversee the border between the magical world and the ordinary human world, those people provide OVERSIGHT get it? There used to be hundreds of members protecting the world but now there are only five. When the book opens, there is a man who takes an orphan girl to the group to try and sell her, not knowing who they all are. The girl is called Lucy and the oversight members believe she might be the solution to their problems and that she could be a new member. Alas, they may be wrong. Meanwhile, there’s another girl called Sara who plays a large role that intertwines with Lucy’s. This book is intricately detailed and spends a whole lot of time building the magic and the world. Also both Sara and Lucy have this power where they touch objects and see into the past — so if that’s your thing, you might like this book. How Did I Like The Oversight? Honestly, The Oversight is an okay book. I love the concept behind it. I think that it could have been pretty amazing, but it felt so overlong. However, this is likely due to my method of reading the book which was via audio. I am thinking that if I had read it via my Kindle, I might have enjoyed it more. Instead, I feel pretty apathetic about The Oversight and will likely not continue the series. My real issue with The Oversight, the reason I did not care for it so much was the narration. Charlie Fletcher’s book is narrated by Simon Prebble. I know plenty of readers love his audiobooks. For me, they just kind of bore me. I always end up zoning out or not paying attention. He just does not have the kind of voice that inspires me to care or sit up and take note. I mean, I gave this audiobook the old college try and listened to all 14 hours and 49 minutes, but I can barely recall what happened beyond some yelling and objects and French and Lucy and Sara. If you do decide to give this book a go, avoid the audiobook unless you are a fan of Prebble, which a lot of people are, I however, am the anomaly who is not. Essentially the narration really bored me.